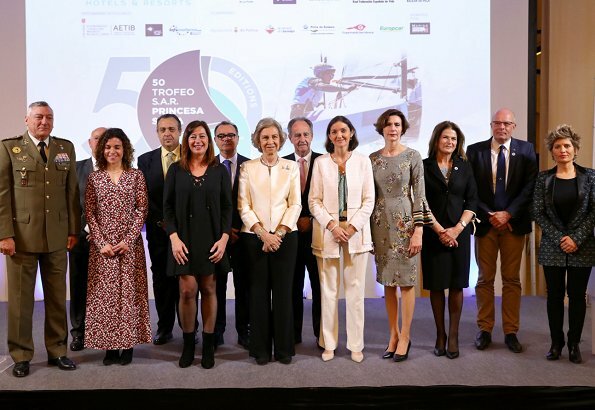 On March 30, Spain's Emérita Queen Sofia and Spanish Minister of Industry, Trade and Tourism Maria Reyes Maroto attended a gala at Son Termes Bunyola in Mallorca, held on the occasion of the 50th anniversary of Princesa Sofia Iberostar Trophy. Trofeo Princesa Sofia is an annual sailing regatta in Palma de Majorca. 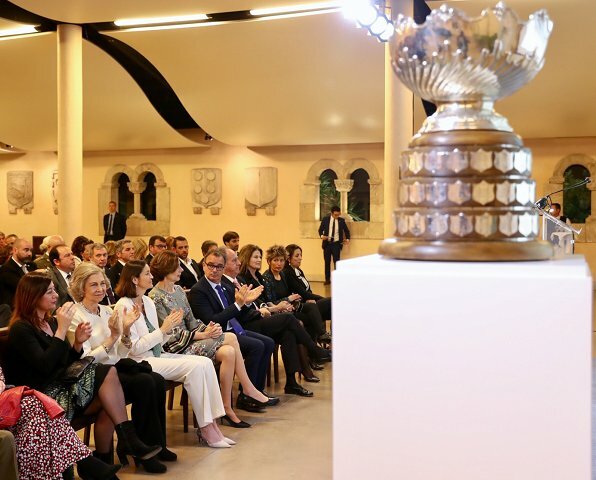 The Olympic sailing world will reconvene next week on the Spanish island of Mallorca, where over 1,200 athletes will compete at the annual Trofeo SAR Princesa Sofia Iberostar regatta. 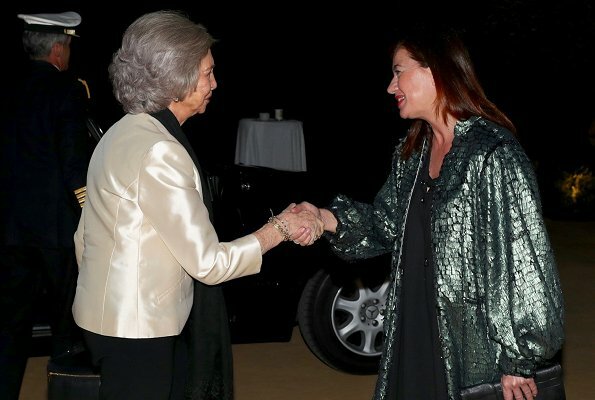 I am a fan of Queen Sofia . She looks chic as always with a smiley face. What a great event, and the 50st anniversary of the Pss Sofia Trophy. What a beautiful silk jacket. 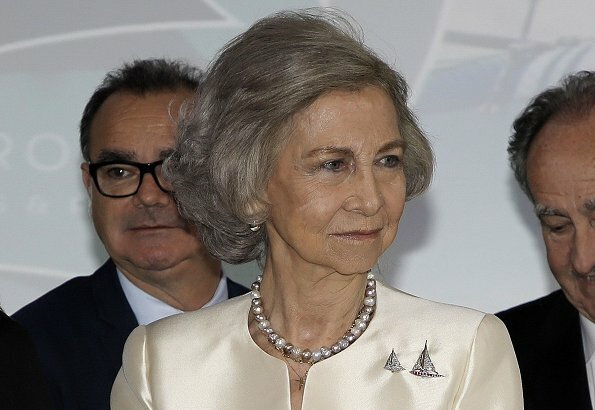 Queen Sofia looks great, the jewelry is lovely too, what a lovely smile. 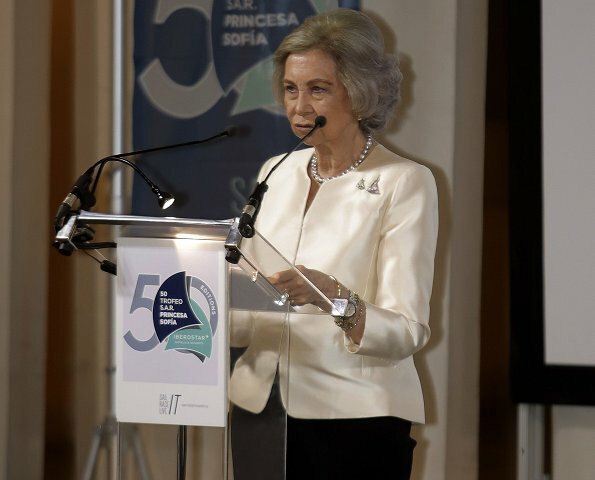 Queen Sofia long ago found her best look and has wisely stuck with it, both for hair styles and clothing shapes. She always appears fashionable, well-kept, and appropriate. This simple jacket is beautifully tailored and I love the fabric and the embroidered sailboats. Black slacks do not detract attention from it and lets the pretty stuff shine. I generally don't like shimmery fabrics on women of certain age, but this is the exception of my rule, the creamy white, along with perfect tailoring makes this jacket fabulous. I also like the fact that she is not wearing a truckload of jewelry, as she ( like her daughter Elena) tends to overdo it. I have noticed that she is looking very fresh lately, whatever facial treatments she is getting, they are definitely working. Some nice things in the group picture. Sofia well put together. The lady in the taupe dress (next to the minister in the white suit) excellent posture. The leader in Mallorca on Sofia's right nooooo to that length of dress. 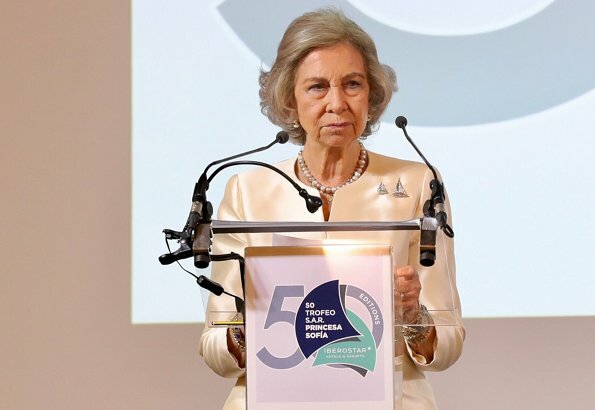 I don't intend to give lessons, but for spanish ears 'emeritus Queen' sounds strange: emeritus is the masculine form of an adjective of Latin origin that has also a femenine one, emerita. 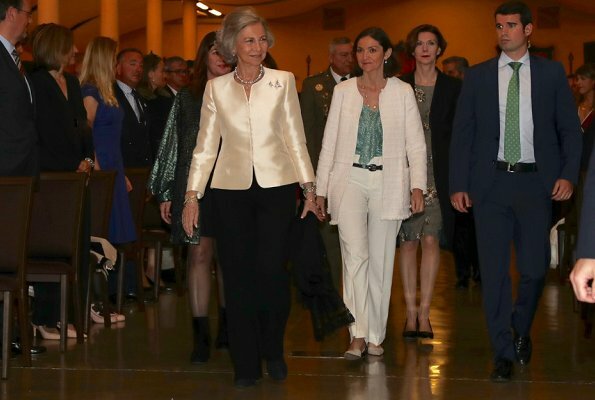 Als Queen Sofía is a lady, she should be styled as Emerita Queen Sofía or, when written in Spanish, Emérita Queen Sofía (we love our accents, same as French do). Very, very nice. Love the simplicity of the tailoring of the jacket and the shimmer of the fabric. The second pic down at the lectern - something about her expression reminds me of Queen Elizabeth II. Ik ben de echtgenote van een koning, ik ben de dochter van een koning, ik ben de zuster van een koning, ik ben de moeder van een koning. En de achterkleindochter van de laatste Duitse keizer. Elegant and through that, beautiful. I love the sailboat pins.